Baby's on the way, and it's time to celebrate! 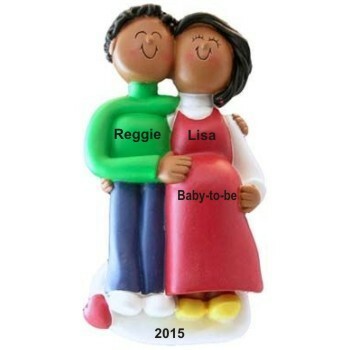 The African-American couple pregnant personalized Christmas ornament is completely handcrafted, so each one has a unique touch from the artist. We make these pregnant ornaments more memorable by personalizing them with the couples names and a special message from you. A year can be included too. An attractive cord makes it easy to display the black pregnant couple Christmas ornament personalized to be a lasting keepsake when it arrives in our custom velvet drawstring bag. Personal use Jan 17, 2016 Nichele B.